IN AN EMERGENCY an escalator can be stopped by breaking the paper diaphragm of a metal drum at the top or bottom of the stairs and pressing a plunger. This immediately cuts off the current supply. THE use of mechanical means of access to and from railway station platforms is of relatively recent origin. London’s original underground system - the Metropolitan and the Metropolitan District - was constructed at only a small depth below the surface, and was extended at an early date to run above ground, as on the “Hammersmith and City” section, much of which is carried on arches. Hence stairways sufficed to take passengers to and from the stations. The same method is still largely employed on the underground lines of other cities, such as Paris, Berlin, and Buenos Aires. With the coming of the tube railways, which were built at a considerably greater depth beneath the surface, staircases were no longer adequate, although it was still necessary to retain them for use in emergency. The original City and South London lifts, installed for the opening of the initial section from King William Street to Stockwell in December 1890, were primitive ill comparison with the lifts of to-day, and of small capacity. As a matter of historical interest, it may be recalled that when this pioneer line was opened, it was provided with an inclined plane with a gradient of 1 in 3½ to enable the cars and locomotives to pass between the tunnels and the Stockwell sheds. This plane, operated by a winding engine, was subsequently superseded by a 20-tons hydraulic hoist. The modern tube lift differs from its forerunners not only in size and capacity but also in the matter of safety devices, the general principle being that of using, wherever possible, mechanical control either to replace the human element, or as a check on it. No lift can start before the gates are closed, owing to the operation of a simple but effective device known as the safety catch. This appliance consists of a switch so fixed as to be in the path of the folding gate. As long as the gate is open, the spring is kept in such a position that no electric current can be transmitted to the lift control gear, and starting is impossible until the resistance of the spring has been overcome by the closing of the gate. Speed is controlled by a governor, similar in general principle to that used on stationary steam engines. Two heavy metal balls are attached to pivoted levers which are in turn fixed to a vertical shaft, revolving through gearing. The faster the shaft revolves, the more are the metal balls swung out by centrifugal force, and should the lift speed exceed a predetermined figure the governor actuates a brake. This device was originally designed to serve as a check on the working of lifts controlled by an attendant travelling on them. In the newer types, no attendant is necessary in the lift itself, as the result of introducing a semi-automatic means of operation known as landing control. With this system, human control is restricted to closing the gates, after which working, including acceleration and deceleration, is automatic. The advantages of the method are that it saves the passenger’s time, and that a single operator can attend to a number of lifts. At certain stations the lift is operated at the upper level by the booking clerk, and an attendant is necessary only at the bottom of the shaft. Underground station design varies so considerably (for instance, the up and down platforms are not always on the same level) that uniformity in the design of lift shafts has been out of the question, but wherever possible a single shaft accommodates two lifts. Apart from the saving in constructional costs, the arrangement is valuable in the event of breakdown; should one lift stop through mechanical defect or breakdown, the second lift is brought alongside, and passengers are transferred through the emergency doors at the side. The existence of these doors is probably unknown to the majority of travellers, since the doors are normally concealed by the advertising panels. In this connexion, it might be pointed out that in general the public has but little knowledge of the steps that are taken to make railway travel safe. The break-down of a lift is, as a rule, due to some minor mechanical defect that can be put right in a relatively short time. To provide for a complete break-down that is likely to take long to remedy, a special hand-winding gear is installed to bring the lift to the top of its shaft in a few minutes. 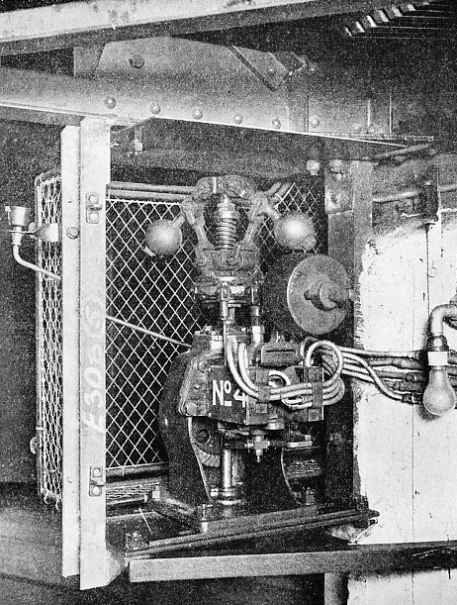 This is a rare contingency - the winding gear has not been used twenty times in the whole history of the London Underground system. 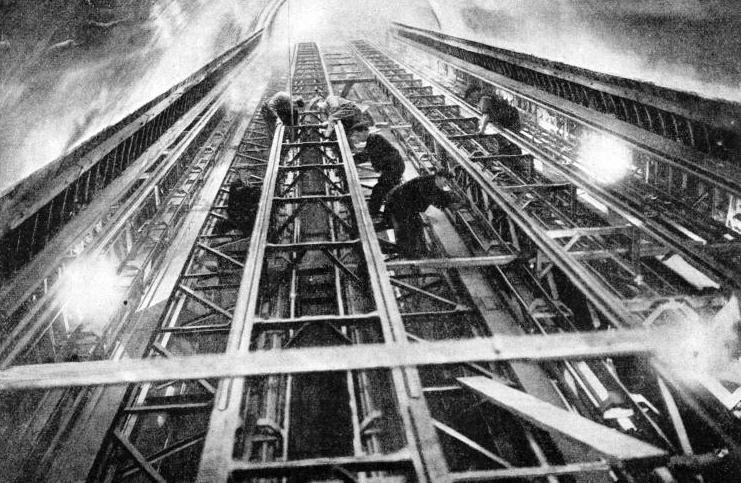 Although the application of escalators to railway purposes came later than the use of lifts, the escalator has a longer history than is generally imagined. Its principle is that of an endlessly moving way, running at slow speed, and in one primitive form it had no vertical lift, but moved horizontally. The use of such moving ways has from time to time been suggested as a substitute for trains, especially on underground lines. Various ingenious schemes have been devised for building a series of such travelling platforms, each running at a different speed, so that passengers could first step on to one that moved forward at, say, three miles an hour, and end up on a fourth way geared to four times that speed; this procedure to be reversed when alighting at stations. These projects have not, however, been put to practical use. AN ESCALATOR GOVERNOR. This is a device for controlling and stopping an escalator should the speed exceed the usual limit of 120 ft a minute or should any defect develop in the steps. An escalator was in use at the Earl’s Court Exhibition over thirty years ago. By a remarkable coincidence, the first escalators in the service of London transport were installed at Earl’s Court Station, where they were inaugurated on October 4, 1911. 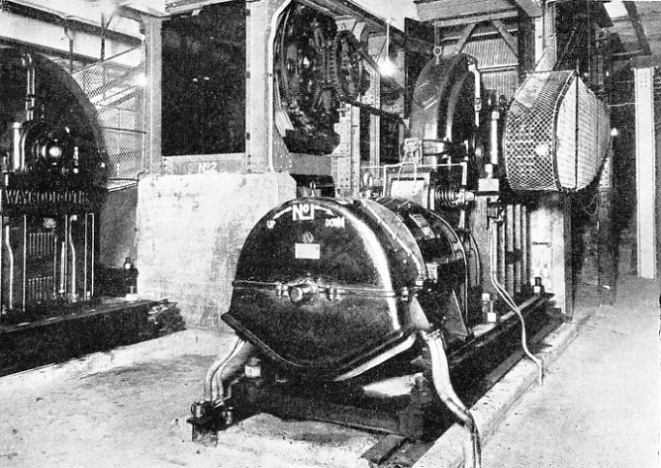 In the following year they were introduced at the Central London’s Bank Station (the first to have three in one shaft). Since then it has been the general practice to equip all new stations below ground with escalators, and to substitute them for lifts when a station is reconstructed, as has been done, for instance, at Chancery Lane, Holborn, and Piccadilly. It may be as well to say that there are difficulties in the way of the complete replacement of lifts. Whatever the depth of a lift shaft, allowance need be made only for vertical movement, whereas the escalator travels in both a horizontal and a vertical direction. Considerations of space, and the presence of subterranean gas, water or electric mains, may make the escalator impossible at stations lying an unusual depth below the surface. Hampstead, where the shafts go down to the record level of 181 ft, is an example of this. The latest practice is to arrange the escalators in banks of three, an arrangement permitting the use of the middle one for reversible working during the rush hours. Another recent innovation is to break up the escalators at interchange stations into two flights; the lower is served by only one line, while the upper is used by passengers to and from both. Typical examples are at Piccadilly and Tottenham Court Road, and a similar arrangement has been adopted at the reconstructed Holborn Station, which serves both the Central London and the Piccadilly Tubes, and is the latest to be equipped with two flights. Where the flights are interrupted it is the general practice to provide a larger number of escalators at the higher level, where passengers to and from two lines have to be dealt with. The speed and the capacity of escalators vary considerably. The capacity is, of course, dependent on length, which varies with the depth of the platforms below ground and whether the escalators give continuous travel or are arranged in two flights. So far as speed is concerned, the tendency in recent installations has been to quicken the maximum rate of movement, while the speed can be accelerated or slowed down to meet fluctuations in traffic requirements. Slowing down is practised when, in the event of heavy traffic congestion, it is necessary to restrict the entrance of passengers to the platforms, or when the service is running irregularly owing to breakdown or other causes. The escalators can be stopped altogether, and then they are temporarily converted into fixed staircases. Where they are arranged in banks of three, the middle one is usually put out of working during the slack hours, both to save current and because a number of people prefer a fixed to a moving stairway. Experimental use has also been made of an automatic device for regulating the speed. This varies from a travel of 90 ft a minute on the older types to double that rate on the later installations. In normal working the maximum speed of the latter is, however, usually restricted to 120 ft, but the rate is gradually being increased, and 160 ft a minute is common during the “rush” hours at a number of stations. With the automatic device referred to speed is increased in accordance with the number of passengers. As each person steps on to the escalator he interrupts a ray of light travelling to a photo-electric cell, and this interruption increases the speed. Lifts move at a more uniform rate, which averages between 90 and 100 ft a minute. There can, however, be no exact comparison between this speed and that of an escalator, since the latter ascends less than a foot with each foot of movement. The basis of comparison between the two is the number of passengers they can handle in a given period, and on this basis victory rests easily with the escalator. Even a short moving stairway can accommodate a greater number of people than a lift; and while the load of a lift has a definite maximum, every movement forward of the escalator uncovers a step available for a fresh passenger or two. Owing to this continuous movement every two escalators can do as much work as five lifts, and the margin will widen as the rate of motion is increased. The escalator represents an improvement both from the point of view of the travelling public, and in facilitating the handling of traffic. But there is another reason for its adoption - the cost of working the lifts, which consume an uneconomical amount of electric current. 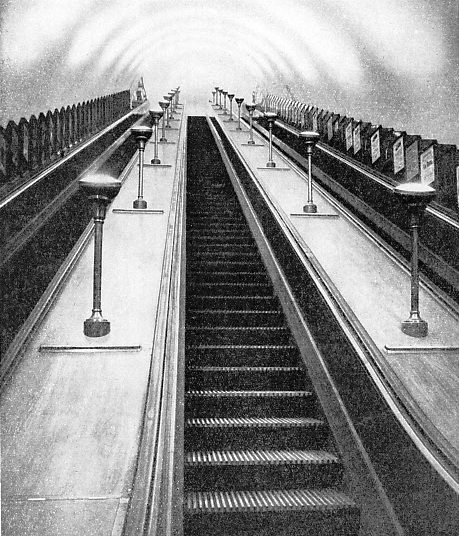 On one of the London tubes this item at one time amounted to about a sixth of the expenditure on the energy required for traction purposes, and figures more or less comparable were shown by other lines in the pre-escalator days. AS A SOLUTION to the “rush hour” problem, the escalator has also been adopted at Waterloo, where it leads from the Underground station to the Southern Railway’s terminus. Another advantage that the escalator possesses is that it eliminates the necessity for providing emergency stairways, since in the event of break-down it automatically transforms itself into a fixed staircase. Station design often involves the construction of long passages between the lifts and the platforms, or between the platforms of two lines served by an interchange station; it has been found possible on occasions to shorten the length of the resultant walk when the lifts are replaced by escalators. Owing both to variations in station lay-out and to the greatly varying depths at which the London underground tracks run below the surface, it is unlikely that the escalator will entirely replace lifts and staircases. An interesting example of the simultaneous use of the three methods is provided by Baker Street Station, which is three stations in one, since it serves the Inner Circle, the Metropolitan Extension, and the Bakerloo Tube. Access to both the Metropolitan stations is by staircase, and from street level to the Tube by lifts, but communication between the Tube platforms and those of the Extension Station is by escalators. Here, each of the three methods is admirably adapted to its special requirements. Statistics give some indication of the extraordinary density of modern urban and suburban traffic that has necessitated such aids to transport as the escalator. When it becomes necessary to provide additional station facilities to cope with increases in passenger movements, it is easier to install an extra escalator than to sink a new lift shaft. The latter is likely to involve considerable reconstruction. This was amply proved when the four escalators at Liverpool Street were increased to five. The escalator has been described by a high authority as “contributing in no small degree to the solution of London’s traffic problem”. It has also added in no small degree to the cost of providing up-to-date travelling facilities. No exact figures are available, but the outlay in recent years on the provision of escalators (including the shafts) and on station reconstruction has amounted to at least six million pounds. Such expenditure is unavoidable on a system possessing at least fifteen stations at which the annual number of passengers is more than twelve millions. The record in this respect is held by Piccadilly, with approximately fifty millions. Piccadilly also holds another record - that of being the only station in the world with eleven escalators. E scalators do not require such elaborate safety devices as lifts; the principal danger to guard against is that of passengers falling or stumbling while getting on or off. There was a certain risk of this happening in the earlier “shunt” type, which necessitated a little side-stepping when alighting, but the newer types are of the “comb” pattern, and so designed that the passenger is in effect automatically “combed off” when he reaches the bottom. MOTORS THAT MOVE MILLIONS. Here is the plant which operates the escalator at Wood Green Station. The escalator can be seen in the background, the section in view being that point where the stairs are vertical, as they pass round the end support. Escalators are so thoroughly guarded against mechanical or electrical breakdowns or defects that it has been thought necessary to provide only one emergency device, of which the purpose is to enable either passengers or staff to stop the mechanism. This is a very simple appliance, consisting of a metal drum with a paper diaphragm, which conceals a plunger. If the paper is broken and the plunger pressed, an automatic cut-out, controlling the escalator current, is brought into action. The appliance is very rarely needed, but its presence is useful in a contingency, such as a passenger's clothing being caught between the moving stairway and the sides. The escalator motors are situated on the underside, and in addition to the moving stairway itself, a continuous rubber band is fitted at the side, that serves as moving balustrade, and which represents yet another refinement in “passenger comfort”. The ultimate place of the lift in underground transport must be regarded as undecided. While modern conditions make the escalator desirable at all deep-level stations and those handling very heavy traffic, engineering difficulties or considerations of cost may prevent the abandonment of lifts at stations where the operating conditions make the escalator preferable. But it can be said that the escalator is tending more and more to become the standard both in Britain and abroad. It can be said with certainty that there will be an increase in the number of escalators at stations that are already provided with them. The future obviously belongs to a device that can handle far more people than the lilt, that eliminates waiting, and that also requires a smaller number of employees to look after a given total of passengers. This last point is of much greater importance than is generally realized. It is those details which to the layman are unconsidered trifles that absorb so much of the expenditure of a modern urban railway system, as we have seen with the cost of electric current for working the lifts. THE PROBLEM of handling passengers in “rush” hours was particularly serious at the Leicester Square Tube Station in London. An immense underground construction now incorporates the latest types of escalators for the descent from the street-level to the platforms. 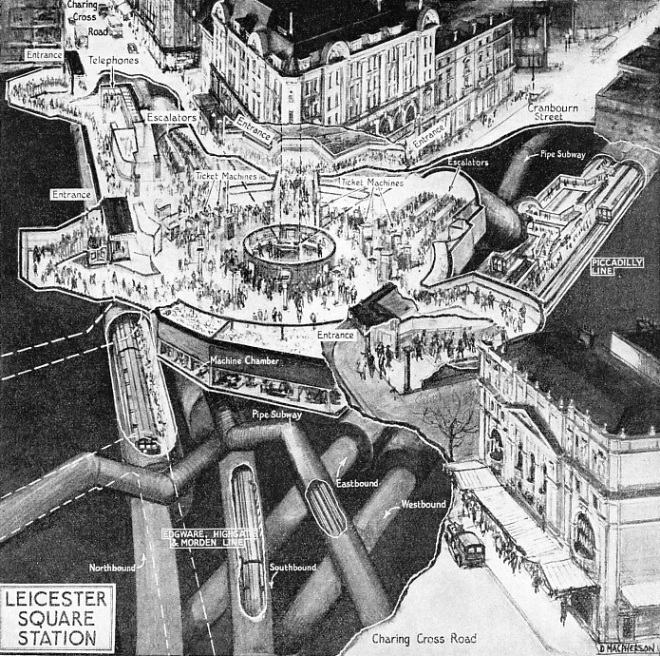 If the reader will turn to the diagram of Leicester Square Tube Station - the most up to date on the London Underground and in the world - he will at once realize not only the part played by escalators in modern urban transport, but also the extent to which they influence station design and add to the convenience of the passenger. The lay-out of this station is deserving of study (see page 345). It has two separate tube railways, at different levels, and five different entrances, in place of the two existing before reconstruction. (As originally built, this station was served by lifts and accommodated only one tube.) Where the site permits, as it does in this instance, it is the present practice to take advantage of station reconstruction to increase the number of entrances and exits. The Underground stations at Piccadilly and Chancery Lane are noteworthy instances. The nature of the resulting flow of passengers to and from the surface makes it desirable to bring them on and off the platforms with the minimum of delay; and, as has already been shown neither fixed stairways nor lifts can handle so much traffic in a given time as escalators. Moreover, station reconstruction, which is a very costly work, is not normally undertaken save at centres where the volume of traffic is both great and growing. Rebuilding a station of this nature without the installation of escalators would slow down the whole of the traffic handling, even if reconstruction involved the provision of additional lifts. This aspect of the escalator has never received adequate attention, and the position may be summarized by saying that without escalators the travelling public would be unable to take full advantage of the high speed offered below ground. Or, to put it in another way, unless the speed and continuity with which passengers are taken to and from the platforms can be made to correspond with the accelerated train service, the inevitable result is platform congestion; and that in turn will sooner or later put out of gear a time-table that is drawn up on the dual basis of running trains at very short intervals and with very short station stops. Indicative of the ever-increasing importance of the escalator is the fact that it has been estimated that the aggregate distance travelled by the London escalators amounts to 2,550 miles a day. This mileage, it must be remembered, is not covered by the passengers, as they are carried for only a section of the escalator's total movement; but it shows how the work of the escalator is being extended, as the process of accelerating the flow of passengers is further improved to avoid platform congestion. In recent years the travelling public has become accustomed to faster escalator travel, and has overcome that slight hesitation before stepping on to the moving staircase that was noticeable when escalators were novelties. To appreciate the value of escalators, one should attempt to visualize London without them, and consider how passengers would regard going back to lifts, and to the consequent crowding of persons all impatient to get to or from the platforms underground. Although, as stated, the escalator is not likely to displace the use of lifts at every station, the extension of the system is among the most important improvements in the modern handling of passenger traffic. The rate of travel of the escalator - which began at 90 ft a minute, increased to 120 ft for normal working, and has been accelerated to 160 ft at many stations, and to 180 ft at others - shows how the escalator habit is developing. The progress is more marked than in other recent development, and finality is not easily denned. It may safely be assumed, however, that the escalator is keeping pace with the increased speed of the passenger in a hurry. THE LONGEST ESCALATOR IN THE WORLD. An impressive view of men at work on the new escalator at Leicester Square Tube Station. The construction of this escalator formed part of a general scheme of improvement estimated to cost £11,000,000.